The Princess Diaries meets Runaway Bride in this wonderful novel about a London career girl who embarks on a whirlwind romance with a mysterious man—only to discover that he’s a prince. "The Runaway Princess has an adorable heroine, divine hero and gorgeous writing - basically, it's just perfect. You'll LOVE this book, I promise! " "The Runaway Princess is a runaway hit...simply charming." "Browne gives us a peek into royalty and proves, with or without a crown, we are all just people at the end of the day with regular emotions. The characters are thoroughly developed, and each of the 448 pages is necessary to craft this tale into the page-turner that it is. A delightful story from start to finish!" "An in-depth fairy tale by a master of the genre, delivering old-fashioned satisfaction with some up-to-date sparkle." "Will delight readers...With characters who are vulnerable but not weak and situations that are extraordinary but believable, this novel is everything readers want a Browne (Swept Off Her Feet) book to be. Fans of Sophie Kinsella, Wendy Holden, and Meg Cabot will want to read this next." 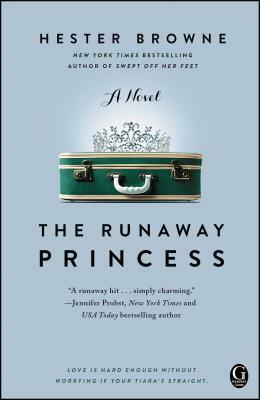 "Hester Browne's The Runaway Princess is a fun, frothy book that explores love in many facets: Amy and Leo's sweet love, her snarky but fantastic friendship with Jo and her complicated relationship with her family. Browne manages to make all of these relationships completely believable, and downright funny sometimes, in spite of the farfetched fairytale plot. Amy's anguished internal monologue as she tries to find her own happily-ever-after will keep the reader chuckling."